Please visit E-Z Chassis Swaps for more information. The testimonials below are from customers who have used their kits. Hello, My friend and I just done an S-10 swap for my 51 Chevy truck. In my opinion, it is the way to do it. First of all, you get everything you need for this do it yourself swap with the S-10 truck you buy at the local junkyard. I went and got a regular cab, long box frame. 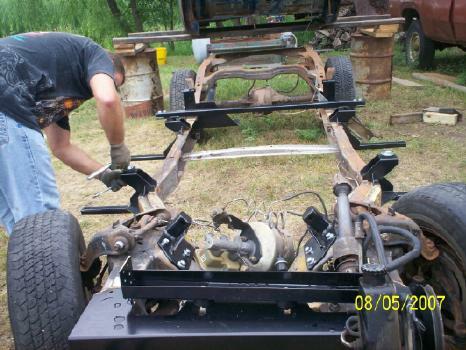 With the frame, came the tilt steering column, power brake booster, wiring harness, fuel tank, all pedals, and seat, if you choose to use it, and a rear end out of a 4 wheel drive S-10 for $150.00. I think the mustang 2 front ends that people put in these trucks cost about $1500.00 or so. Quit a difference in cost thus far. Plus, with the S-10 frame, you can thank General Motors for having the geometry all set for you unlike the mustangs front end swap and the rear end swap you have to do yourself. Yet again, saving time so you can cruise earlier then later. Another advantage is the fact you are now playing with a frame that is 30+ years newer then the original one. Plus, now you can buy parts for this right from your local parts store. Cheap and easy to get. I had the frame already to weld on the brackets, that I purchased form Ez swaps. Keep in mind, this was my first ever body swap of any sort. My friend that helped me, had allot more experience with this then I had. I can not thank him enough for what he did for me. The thanks are endless. Anyway, back to the truck, I did have the frame ready for the new kit. It took about a good solid 3-4 hours to install this for me. I thought that was pretty good considering my lack of experience with this. We then installed the cab of the truck. All on the first day. The next wekend, we installed the small block chevy engine with trans and the front clip. This is just my thoughts on this, but if you are well prepared for this, you could probably get this truck on the street with in a couple of good solid weekends. Considering you had a drive shaft made and what not. Enclosed is a couple of pictures for you to see what the truck looks like. If you have any questions, I would be more then willing to try to answer anything you may have. 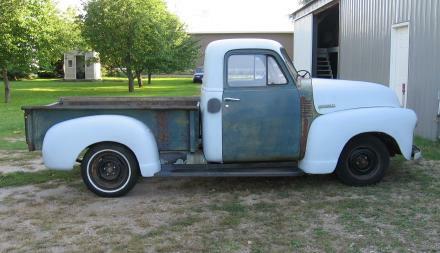 I started with a 1948 3/4 ton truck, an 82 S10 long-bed and 53 short-bed. I purchased the kit from E-Z with a 2 body drop and motor mounts for the 4.3 V6. I used a V6 because I was able to use the stock fan as well as not worry about overloading the suspension oppose to the V8. With the V6 and 700 R4 transmission it has a very smooth ride. I also used the rear-end from a 4×4 S10 for the extra width and 2 wheel spacers in the front. With this it fills out fender well spacing. The mounting instructions were very clear. I removed all existing mounts and measured and marked for new mounts per the instructions. I bolted first to make sure that everything would mount up as it should and after brief assembly, disassembled and welded it permanently. I used 2 spindles and 2 lowering blocks plus the 3/8 locating plate from the kit that assists in centering the rear axle in center of the rear fender. Ed from EZ Chassis Swaps was extremely helpful with any questions as well as suggestions for radiator and wheel spacers, engine and transmission combinations, etc. I was a machinist for 14 years and can appreciate the quality of design and craftsmanship that was put into this kit. I am very pleased with my purchase and would recommend this to anyone doing a conversion.